The Case Transgenic and Targeting Facility has an outstanding record of success in making transgenic and knockout mice. Our goals are to produce a minimum of three transgenic founder mice per construct, three strong chimeric mice per cell line, three targeted cell lines per construct and sufficient rederived mice to re-establish the strain quickly. We exceed these goals for the majority of orders. We have almost 40 different CRISPR knockin/out projects at different stages of completion. Twenty projects have progressed to the point that live founder mice with the desired allele have been generated. Most of these projects are point mutation knockins, one project is an indel gene knockout, two are deletions (1 and 16kb). The percentage of mice with the desired knockin allele has averaged 25%, ranging from 2-88% of the mice delivered. 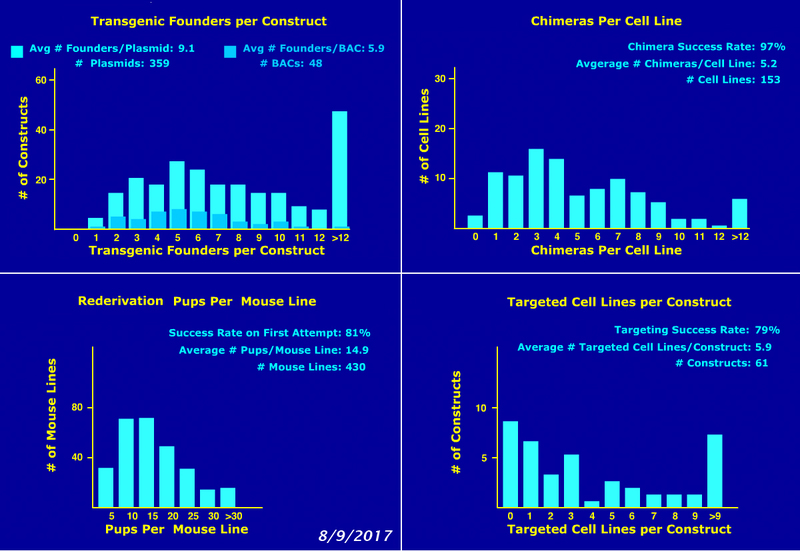 This is 4 founder mice carrying the knockin allele per project on average, ranging from 1-10 founder mice per project. Where we have deep sequencing data on the mutant knockin allele, 70% of the founder mice have the desired mutant allele in more than 45% of the reads. Given the prevalence of the mutant allele in founder mice, it is not surprising that in projects that have progressed to the point of mating, all have transmitted the mutant allele to the next generation. "This is a two-dimensional graph that was made by projecting the mean of the individual facility in relation to Principal Components 1 and 2. In this graph, the X-axis (corresponding to Principal Component 1) is interpreted as “Transgenesis efficiency” or “Transgenic pups obtained”. Facilities located to the right have better values than those located to the left. The Y-axis (corresponding to Principal Component 2) is interpreted as “embryo transfer efficiency” or “Pups born”. Facilities located above zero have better values than those located below. The ideal position for a facility is in the upper right quadrant. Facilities showing the best performance regarding the ratios considered will be found in this upper right corner. Your facility is depicted as an upside down blue triangle while the other facilities are depicted as green open circles. According to the position of your facility, the following recommendations should be considered. If your facility is located in the upper right quadrant, don’t change anything. If your facility is located in the upper left quadrant, total pup yields are good, but you may be able to improve your transgenic pup yields. If your facility is located in the lower right quadrant, transgenic pup yields are good, but you may be able to improve your total pup yields (e.g., by improving the embryo-transfer procedure). 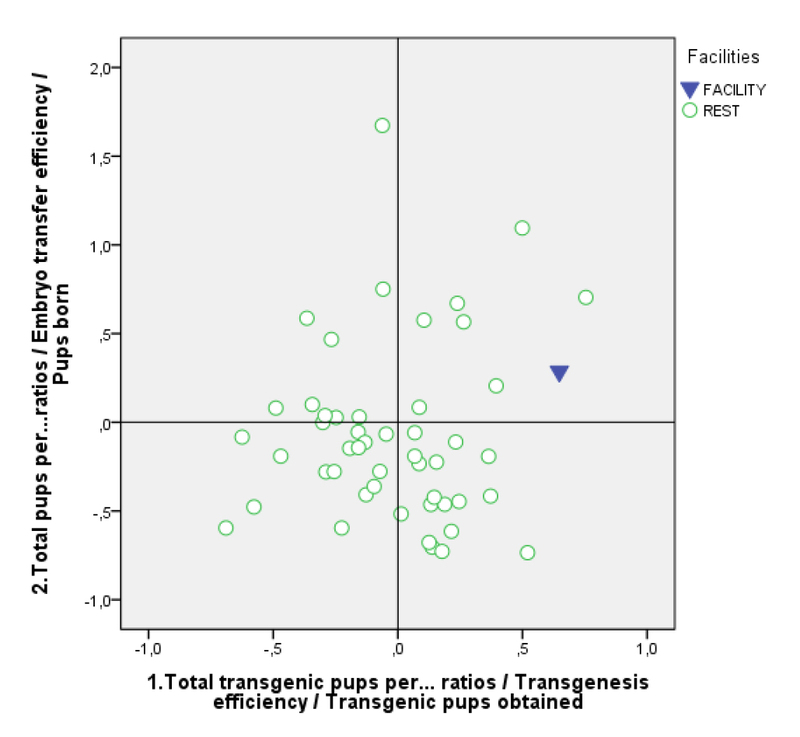 Finally, if your facility is located in the lower left quadrant, you may be able to improve both total pup and transgenic pup yields."